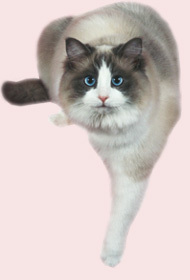 Since 1995, we have been breeders of multiple Supreme Grand Champion Ragdoll international winners. We are responsible breeders of healthy, socialized Ragalong Ragdoll kittens, raised under foot. Browse our friends for hundreds of happy ragalong ragdoll kitten owners' testimonials. A Ragdoll is a large, minimal-shedding, non-matting lovable bundle we equate to the feline equivalent of the dog. They follow you everywhere, even to the loo. Our Cats have all been tested 3 times for FECV and are negative. They are also negative for FELV and chlamydia as well as any other contagious diseases. They are guaranteed fully for health and temperaments. Ragalong Ragdolls is founded on World Champions Bloodlines and producer of many supremes.